SNRE Associate Professor Pete Fix, who has conducted recreation surveys for state and federal agencies over the past 12 years, is undertaking his most ambitious Alaska project to date — with help from an Extension team. Working under a three-year $399,407 cooperative agreement from the Bureau of Land Management, the research team will train others to survey recreational and subsistence users of public lands across Alaska. The information, collected mostly on site, will help agencies determine how Alaskans and other visitors access public lands, whether access is adequate for different stakeholders and how it can be improved. “Hopefully it will lead to better planning for access to federal lands in the region,” says Fix. Rural and subsistence users of public lands will be surveyed at two conferences, but the largest effort will take place this coming summer. Six aides, most likely college students, will survey users of public lands at designated locations between Memorial Day and Labor Day. 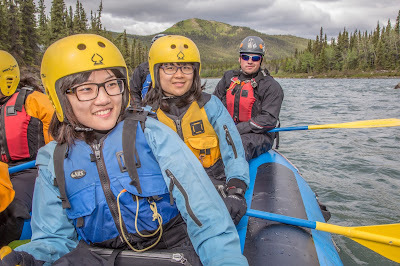 In the Interior, for instance, they plan to interview travelers at the Coldfoot visitor center, the Wickersham Dome trailhead, Nome Creek Valley, Tangle Lakes, Denali National Park, Public Lands Information Centers in Fairbanks and Tok, and at the Tetlin National Wildlife Refuge. Locations are equally varied in Southcentral and Southeast. Using iPads and paper surveys, the aides will interview in the same locations several times through the summer. “I’ll be paying people to hang out there,” Fix jokes. Fix said help from an Extension team is key to the statewide survey. Lisa Wedin, a program assistant in Anchorage, will provide coordination, training and logistics help for the aides, who will survey individuals traveling by cruise ship, ferry, airplane, car and bicycle. Jasmine Shaw in Sitka will also help with logistics. Thorne Bay Agent Karen Petersen will advise on the survey in Southeast and Extension Evaluation Specialist Alda Norris is helping with the online survey design. Samples will be taken on certain dates, timed to take advantage of the height of the fishing season at the Russian River, for instance, and moose hunting in the Nome Creek Valley. Samples will target local and non-local users, who will be asked to answer a longer follow-up survey by email. All told, Fix hopes to get 1,800 surveys answered in the Interior, 2,700 in Southcentral and 2,100 in Southeast. All the information will be assembled and analyzed by the end of 2017. Fix said the recreational use surveys should help with long-range planning on how to improve the visitor experience.